In Part 1 of this series on natural and chemical sunscreens, I covered the basics. Here, we see that relatively minor shifts in priority between efficacy and potential health risks yield starkly different results in evaluating sunscreens. To show this, I compared product recommendations from Consumer Reports and Environmental Working Group. These two organizations consider many of the same factors but weigh them differently. Consumer Reports is a non-profit, non-partisan, research advocacy group. It bases its reviews primarily on efficacy and does not factor in safety. It does not set forth a stated preference for natural versus chemical sunscreen. That said, Consumer Reports acknowledges concerns about sunscreen ingredients, discussing the chemicals oxybenzone and retinyl palmitate, as well as potential dangers from nanoparticles of titanium dioxide and zinc oxide. According to Consumer Reports, nanoparticles have been linked to reproductive and developmental effects in animals. Despite these references, Consumer Reports acknowledges that research has not determined the long-term effects of these mineral or chemical ingredients on humans, and therefore, concludes that the benefits of sunscreen outweigh the risks. Coming from that vantage point, Consumer Reports’ recommended sunscreen list considers efficacy to be paramount, and on that, suggests that chemical sunscreen outperforms natural (if you want to view the full list and ratings, you must subscribe). There are no natural sunscreens on the list, and many of Consumer Reports’ recommendations include SPFs of 50+ and sprays. Top rated sunscreens include products from Vichy, Coppertone, Banana Boat, L’Oreal, La Roche-Posay, Avon, Neutrogena, and Equate. Sunscreen stability (how quickly an ingredient breaks down in the sun, using an in-house stability database compiled from published findings of industry and peer-reviewed stability studies). EWG puts more stock into animal study data suggesting organ toxicity from oxybenzone and retinyl palmitate. And it questions the safety of all other chemical ingredients. From EWG’s perspective, since we do not know how animal studies translate to humans – whether we will suffer similar health consequences or whether effects are dose dependent – EWG errs on the side of caution. In the spirit of doing no harm, EWG does consider origin or composition a safety criterion. The group scrutinizes all chemical sunscreens. EWG’s conclusions about efficacy also differ from Consumer Reports, as it argues that physical blocking agents are comparable to chemical agents. EWG’s position may be explained in part on its stance that sunscreen generally does not actually prevent most skin cancer. Top rated sunscreens include products from All Terrain, Badger, California Baby, Goddess Garden, Sunumbra, and TruKid. EWG also publishes a “Sunscreen Hall of Shame.” Ironically, you’ll notice that Neutrogena, a “dermatologist recommended” brand that Consumer Reports highly rates, tops the list this year. The differences in weighting between efficacy and health considerations by Consumer Reports and EWG yield some funky results for the same products. 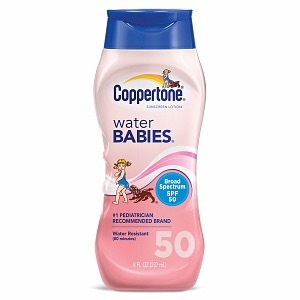 For example, Consumer Reports rates Coppertone Water BABIES SPF 50 lotion very highly (98 out of 100), while EWG gives the same sunscreen a score of 5 out of 10 (1 being the best). This is at least in part because EWG docks a product significantly for making a claim of SPF 50+, being a spray, or containing either oxybenzone or retinyl palmitate. On the other hand, questionable efficacy and reliability (or UVB protection) results in low scores for Consumer Reports. For instance, Consumer Reports gave Babyganics Mineral-Based Sunscreen Lotion SPF 50 a 44 our of 100, and noted that it actually only provides SPF 25 after water immersion – 50% less than its claim. EWG gives the same products a 2 out of 10 (1 being the best) and reports that it provides “good” UVA protection and a “moderate” balance of UVA protection in relation to SPF (UVB). 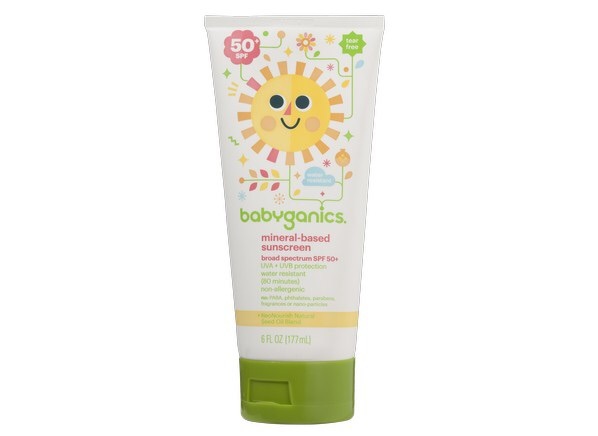 Interestingly, this Babyganics sunscreen made the EWG’s list of “Best Beach & Sport Sunscreens,” along with 216 other (only) mineral sunscreens. This title suggests that these sunscreens can withstand water and sweat for some duration of time. However, I was not able to find an indication of water resistance testing. As I stated in Part 1, I still stand firm that efficacy is the most important criterion for sunscreen. However, I appreciate the safety concerns. Perhaps by cross-referencing both sources, you may be able to find the right mix of efficacy and health considerations. ← Natural vs. Chemical Sunscreen: What’s Up With That?